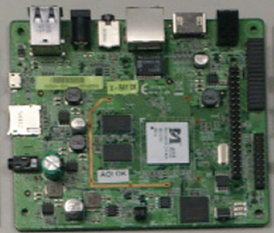 In this tutorial we will walk you through the steps necessary to develop Android apps for the OpenOTT board. First we describe how to set up your development PC and build and run a simple Android app. These steps are not specific to the OpenOTT board, so we will refer to official Android documentation. Next we run the same app on the OpenOTT board and finally we build a small example to exercise the RapberryPi compatible connector. All but the final step can be run without the breadboard starter kit. 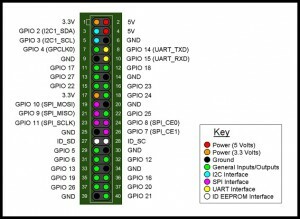 Should you have different electronics connected to the RaspberryPi connector, the procedures are very similar, and the changes required should be minimal. To ensure that your Android development environment is properly set up, we recommend that you first try running an example app consisting of pure Android Java code. 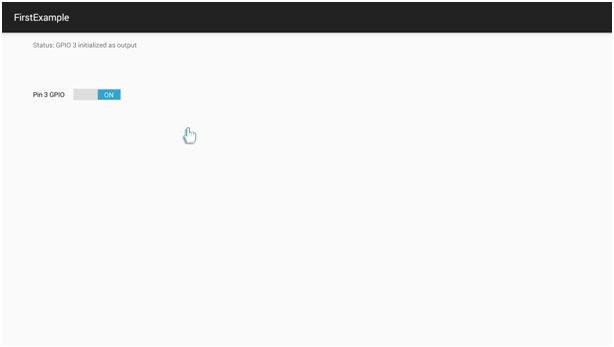 This will ensure that the HelloWorld app is working correctly. See e.g. On the OpenOTT, open the Settings app and click Ethernet. Note down the OpenOTT’s IP address. On the OpenOTT’s display, there should be a popup, saying “Allow USB debugging” – click “Always allow from this computer” and press OK.
Connect pin 3 of the IO connector to the longest pin (+) of the LED. Connect to the shortest pin (-) of the LED to a 220 Ohm resistor. This resistor will protect both the LED and the GPIO pin from excessive current. The IO app is a test app that can be used to get and set the values of the pins on the OpenOTT’s RaspberryPi connector. It can not, however, perform logic between the inputs and outputs. To ensure that electronics is wired correctly,, configure pin 3 as output, and change its value back and forth between low and high – watch the LED turn on and off. You should now be able to turn the LED on/off using this UI, rather than the IO app. We assume that the previous Android tutorials have made you somewhat familiar with the general structure of an Android studio project, so feel free to investigate the example project. In Android terms, a service is a software component, which runs in the background, offering functionality to other apps without having a UI of its own. 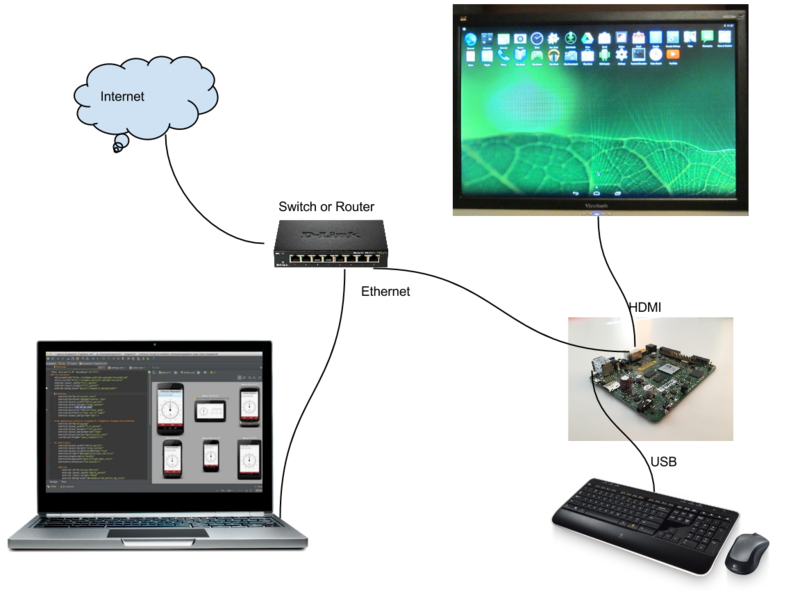 Futarque’s Mediarite service is exactly that – and one of the functionalities it offers is an IOService, which is used to access the IO pins of the Raspberry Pi compatible connector. The way an Android app communicates with a service is through an IPC mechanism called Binder, which uses an interface language called AIDL. Fortunately you do not need to know about this, as we have created a library called libioservice, which maps regular Java methods to AIDL. But we do need to do two things: Instruct your Android project that it should use libioservice and create a connection to the Mediarite service. 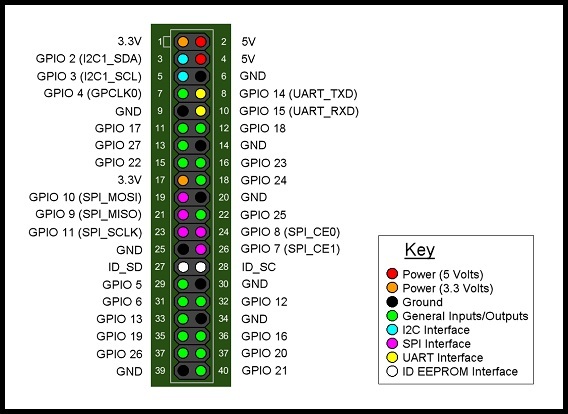 This very simply sets the GPIO pin’s state to the same state as the switch button. The use of the IO library should be pretty straight forward – there is autobuilt help available from within Android studio and we are working on Javadoc documentation. For the moment, you can use the FirstExample as boilerplate code for new projects, but in the future we may wrap the service connection into a helper class in the libioservice. The DVB tuner is accessed via a REST API. 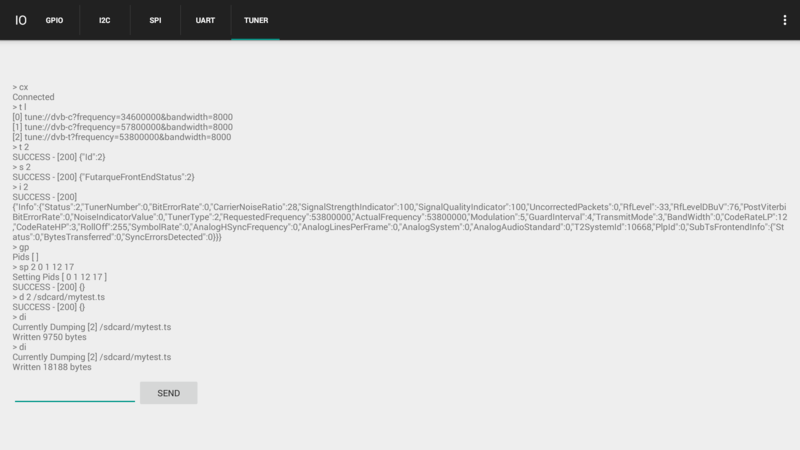 The REST API consists of the needed methods for tuning, monitoring and streaming the transport stream from the tuner. The REST API is exposed over a local Unix socket on the Android system and over a tcp port. If you implement a local client, we suggest that you use the local socket for your implementation. 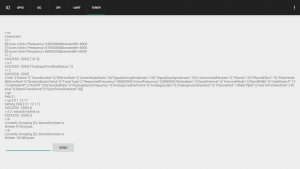 Using the IOController java API you can get the name of local socket. External clients will need to use the http port. Discovery of the server url can be done via UPnp (SSDP) with the type “urn:futarque-com:device:FutarqueNetworkTuner:1”. Default is universal if value is not set. lnblolow   : LNB low frequency, integer value in decahertz, default is 975000000 if not set. lnblohigh  : LNB high frequency, integer value in decahertz, default is 1060000000 if not set. default is automatic if not set. Below is a usage example of which command to use to tuner to a DVB frequency, monitor its status, select some PIDs and save the resulting transport stream. We hope this tutorial has been interesting to you, and sufficient to get you started with OpenOTT hardware development programming.